My mother set us up in the backyard on a big blanket with random pots and pans, while she cooked laborious weekend meals. There was a fig tree, an apple tree, a peach tree, a couple of what we called Chinese orange trees and tons of azaleas and herbs that offered an immense array of witch-crafting material. But among our most prized ingredients were dried jamaica flowers, known here as hibiscus flowers, stored in a big jar in the kitchen. Although not native to Mexico, with a contested origin between Africa and India, jamaica flowers arrived in colonial times and are now deeply integrated into Mexican cuisine. Mainly used to prepare agua de jamaica, one of the freshly flavored waters (aguas frescas), they are enjoyed daily throughout Mexico. 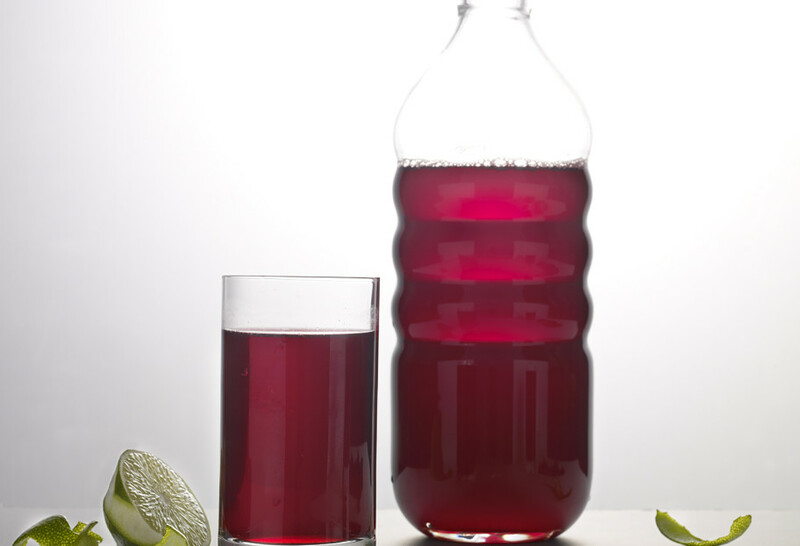 Agua de jamaica is extremely popular because its tart flavor, also refreshing and light, complements Mexican food so well. As a treat, and to make our wait more bearable, my mother would bring us a big pitcher of agua de jamaica. We would drink it, of course, but we would also pour it into ice cube molds with wooden sticks to make mini popsicles, or mix it with gelatin to make happy-looking jello, both of which are common in Mexico. It was more fun, however, to sneak into the kitchen to get the dried flowers and experiment firsthand. Oh, how fascinating it was to see how they slowly infused the liquid in which they were soaking with an intensely deep and vivid red color. Their flowery and fragrant smell seemed to help with our magic spells, too. After my husband and I moved to the U.S. in the 1990s, I would stuff them in my suitcase or ask someone to bring some when they visited from Mexico. My craving intensified while I was pregnant, since aside from their tangy taste (more welcome when carrying extra weight), their diuretic and digestive properties and richness in vitamin C and minerals are common knowledge in Mexico. Luckily, I don’t have to stuff them in my suitcase anymore. As with most ingredients used to cook Mexican food, they can be found in a store close by or with the click of a button, which is wonderful because I use plenty of them. The traditional jamaica water is a staple on my table, but most of all, I am still playing with them in my own enchanted forest or busy kitchen. Like other adventurous Mexican cooks, I have been experimenting with and expanding their culinary uses. For example, the easy-to-make concentrate used to flavor water makes a rich and sophisticated base for a thick and syrupy sauce to drizzle over gamey meats such as duck, venison or lamb. An even more daring approach, which I find irresistible, is to munch on these wholesome flowers. However, they are hard and rather tasteless as they are. They have to macerate for at least a couple of hours before they become deliciously chewy and release their tart and cranberrylike flavor. Thus, they are perfect for making exotic vinaigrettes. The concentrate has also been splashed into margaritas for some time now, and I was recently surprised to find hibiscus-infused tequila at a restaurant in downtown Washington, D.C. While I am no tequila connoisseur, it tasted heavenly. These days when my mother visits, she tries to set up my three boys on a big blanket with pots and pans in our backyard. Within 10 minutes, the potion-making ends in a wrestling match. However, since one of their favorite things is to have brownies outside, maybe next time we bake some I can drizzle sweetened jamaica syrup and whipped cream on top. That is a recipe I still haven’t tried. Article written and photos taken for and published by NPR’s Kitchen Window on July 22, 2009. In a 6- or 8-quart saucepan, bring water to a boil. Add flowers, stir and simmer over medium heat for 10 to 12 minutes. Turn off the heat and let the mixture cool a bit. Strain mixture into a large container (with a lid to cover later), and add the sugar and lime juice. Stir until well-dissolved. Once the concentrate has cooled, cover well and refrigerate. It will keep in the refrigerator for months. To make the concentrate: In a saucepan, pour 8 cups of water and place over high heat. Once it comes to a boil, add the jamaica flowers, simmer at medium heat for 10 to 12 minutes and turn off the heat. Let it cool down and strain into a heat proof glass or plastic water jar. Add the sugar and lime juice, mix well, cover and refrigerate. It will keep in the refrigerator for at least 3 months. When ready to serve, dilute 1 cup concentrate with 3 to 4 cups water, or to your liking, and some ice cubes. Sauce: Pour concentrate and broth into a medium-sized heavy saucepan over medium high heat. Bring to a boil and add the orange rind, bay leaf, cloves, peppercorns, cinnamon stick, vinegar and salt. Simmer at medium-high heat for about 35 minutes. Bring heat down to medium-low, as the sauce will have reduced considerably and will be simmering too strongly. Keep on a low simmer until the sauce achieves a thick, syrupy consistency, about 10 more minutes. Don't let it thicken too much, as the sauce will continue to thicken as it cools. Remove the spices using a slotted spoon or strainer, and reserve in a container. If you are not going to use it in the next couple of hours, or you made more than you need, let it cool, cover and refrigerate. Reheat before using. Duck breasts: Thoroughly rinse the duck breasts under a thin stream of cold water and pat dry. Make 6 to 8 diagonal cuts through the skin of each breast, being careful not to cut through the meat. Season with kosher salt and pepper to taste. Heat a heavy skillet over medium-high heat. Once it is hot but not smoking, place the duck breasts skin-side down and sear for 6 to 7 minutes, until the skin is brown and crisp, and most of the fat melts and turns into liquid. Move the breasts, skin-side up, to an ovenproof dish or pan. Place in the oven for 5 to 9 minutes, depending on how rare you like your meat: about 5 minutes for quite rare and about 8 to have a nice pink center. Remove the breasts from the oven and let them sit for a couple of minutes before slicing. Slice diagonally along already marked skin. Drizzle jamaica and orange sauce on top. Pour the champagne vinegar into a 3- to 4-quart mixing bowl. Slowly add both the olive oil and the safflower oil as you whisk them into the vinegar with a fork or whisk. Mix in the minced garlic, sugar, salt and pepper. Add the flowers and toss them well. Let them macerate from 4 to 6 hours. Remove the flowers with a slotted spoon, reserving the vinaigrette. Chop the flowers and return them to the vinaigrette. You may use then, or cover and refrigerate up to a week. Mix very well before using and taste for seasoning as it may have become a bit more tart as the days go by and need more salt and sugar. Place the watercress in a salad bowl. Toss with some vinaigrette and top with goat cheese slices and toasted pecans or pine nuts. Hi Pati! I would love to make the Jamaica concentrate. However, if I make it without sugar, will it still keep for months in the refrigerator? I add cinnamon and sometimes ginger. Would those ingredients also affect it? I want to keep it for months! I just wonder if sugar is what preserves it. Thank you! So in order to make agua de sandia or agua de piña would the recipie be the same, just substitute the jamaica for the fruit? BTW, ur show is the best! We’re huge fans in San Antonio! Oh thank you so much and hola San Antonio! And the answer is no: to make hibiscus flower you have to simmer and steep the flowers in water because they are dehydrated and you want to rehydrated and unlock their flavors. But for fresh fruit, all you need to do is cut the fruit, remove any seeds, and throw it in the blender along with water and sugar or a sweetener like agave or honey to taste. Easy! Thank you for the Jamaica [Hibiscus] recipes AND the exceptionally good commentary about the plant and its flowers. I a botanist with many Hispanic friends, and was introduced to Jamaica many years ago. The recipes always began, “My mother puts…” or “My wife likes to….” For a drink for myself, in the evening I put a handful of dried flowers in a two-quart pitcher, fill it with cold water, and refrigerate it overnight. 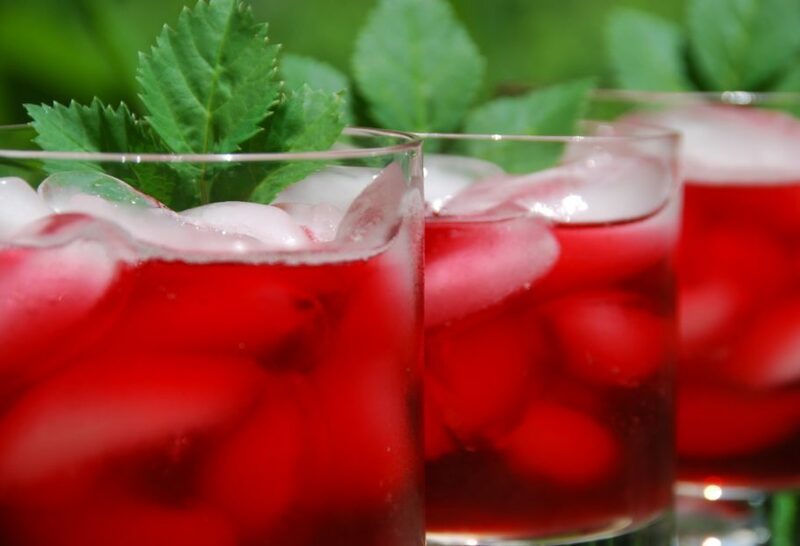 By morning is is a rich red “iced tea” which I sweeten [I use Truvia] and drink with a twist of lime. Now I am ready to make the concentrate, then the vinaigrette, etc. Again, thank you, Patti, de mi corazon! WOW! The seared duck looks and sounds delish, TRUE! Since being to Egypt, ABSOLUTELY love hibiscus anything too! Has LOTS of health benefits, lowering cholesterol, blood pressure, keeping the body (in EXTREME temperatures) cool..LOTS of GREAT ways to use in a recipe! I use it A LOT in baking and cooking too! Here’s my recipe for Coconut, Lemongrass and Hibiscus Ice Cream for all to hopefully enjoy TRUE! Ask your local grocery store or natural foods store, I am sure they most carry them in Miami! Was wondering if I could dry my own hibiscus flowers? Do I dry the whole flower with pistels and can I use any variety? Ps love your show, coconut flan amazing! I made jamaica this week and it was great! I kept the concentrate in the fridge and enjoyed it all week long. I gave some away to friends and they loved it too. Thank you! I agree with Bobvbie Meraz – Love your recipes, but can’t seen to find them on line to print. Especially looking for the flnk steak tacos. I could not find it to print on line. I just tried the iced jamica tea. It is delicious! I cant believe i would ever want to cook with hibicus flowers n now i cant find the recipe for the flank steak tacos pls help me. I cant wait to surprize my husband who is from Durango Mexico. I really enjoy watching u on pbs thank u…. Hola Bobbie, Thank you for watching! Here is the recipe for the flank steak tacos: http://patijinich.com/cgi-bin/mt5/mt-search.cgi?search=flank+steak+tacos&IncludeBlogs=3&limit=20&x=0&y=0. Let me know how they turn out. I am so thrilled to even read about mexican food. estoy una aficionada de mexico, y por las cuatro ultimos anos = tengo la marivillosa oportunidad de vivir con una amiga que me da el gusto de la cusina mexicana.